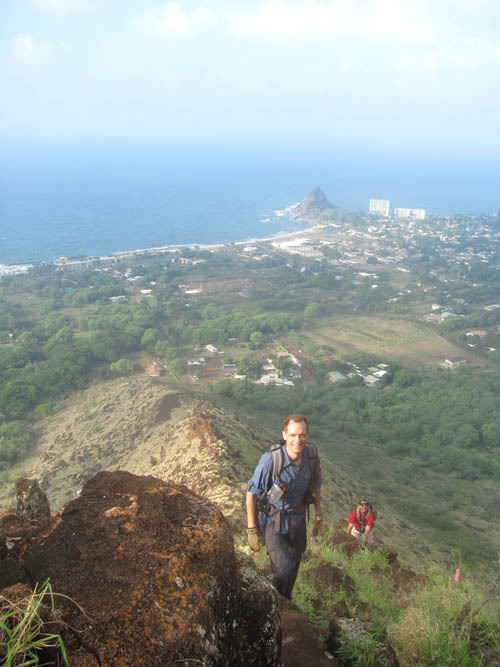 I joined the Hawaiian Trail and Mountain Club (HTMC) to climb to the top of Kamaileunu – the massive ridge that descends from Mount Kaala and separates the valleys of Waianae and Makaha. 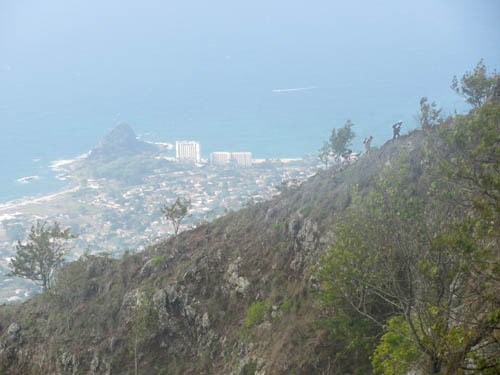 While only a 7-mile round trip, the hike starts at sea level and climbs 3,210 feet to the third highest peak on Oahu. 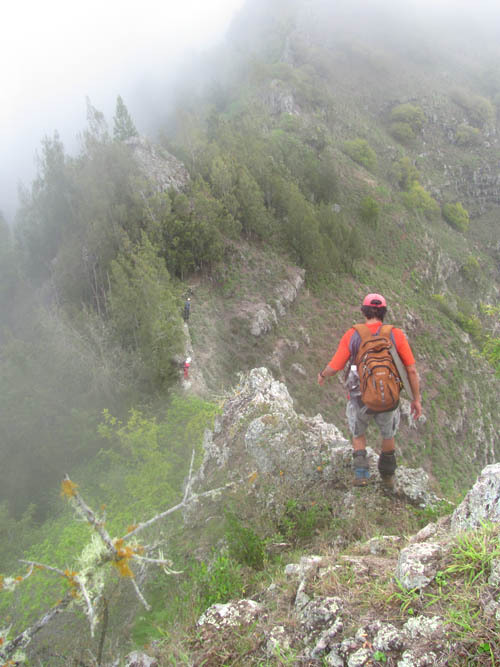 Add in steep rocky cliffs, rugged uneven terrain, and the brutal mid-day sun and you have one of the toughest trails on the club’s hike schedule. Kamaileunu is exceedingly hot and dry. It lies in the rain shadows of both Mount Kaala (the highest peak at 4,025 feet) and Puu Kalena (the second highest peak at 3,500 feet). With no shade on its lower flanks, the rocks bake in the sun and hikers are urged to bring more water than usual. 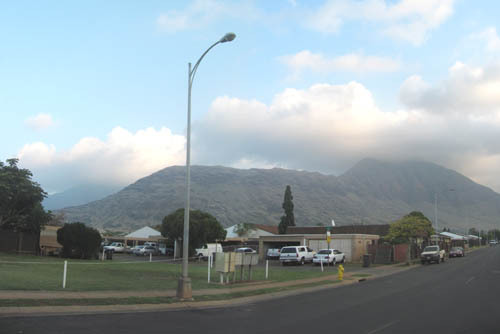 When I saw clouds shrouding Kamaileunu Ridge and the Waianae Mountains, I was thrilled – we would get a free pass from the sun! So we parked our cars on Ala Akau Street, put on our packs, and pushed-off for the base of the ridge with great enthusiasm. Whenever I do Kamaileunu I always visit Kuka’au’au Cave which sits near the foot of the ridge just above a Board of Water Supply pumping station. The pumping station taps an aquifer that used to supply a fresh water spring at the base of the ridge in ancient times. 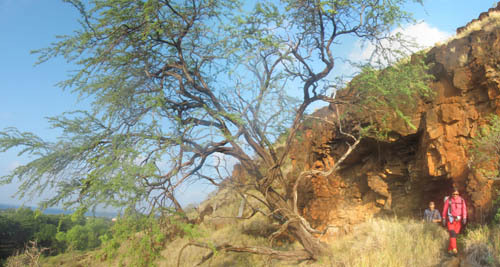 A large kiawe tree marks the entrance of the cave which has a large opening about 30 feet long, 15 feet high and extends some 40 feet into the mountain. 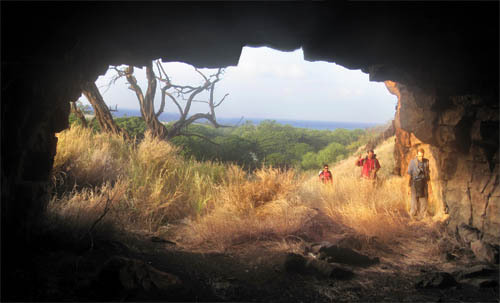 In the photo above, Pat Rooney, Richard Bailey, and Miyo Kimura pass through the entrance of the cave. 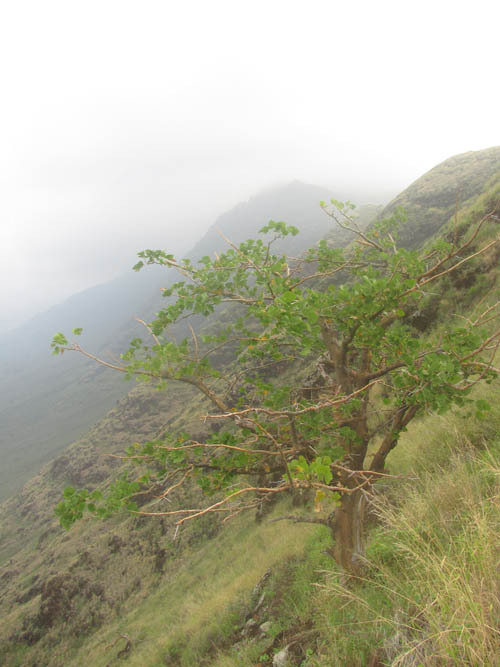 The distinctive thing about this kiawe tree, is that it is green even in the driest months. I speculate that its roots tap the aquifer too. After emerging from the cave we scrambled up the side of the mountain to gain the ridgeline which we followed more or less for the rest of the hike. 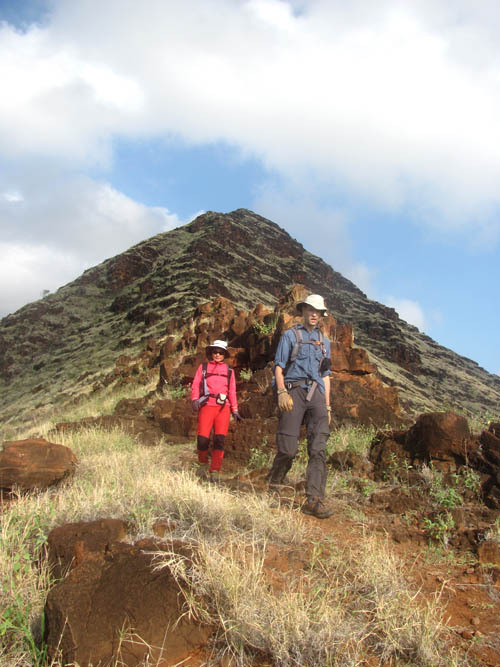 Another interesting feature of the hike is that it passes the remains of a heiau on the lower part the ridge. 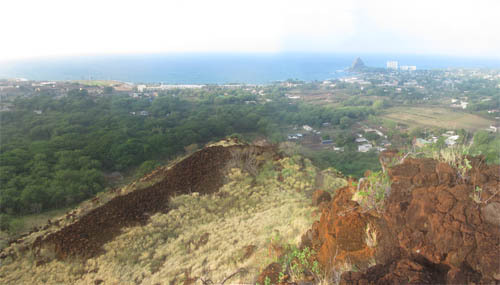 Strategically overlooking Makaha and Waianae, the heiau has a commanding view of the Waianae coastline. The heiau, cave and springs were all part of Kamaile village which subsisted by growing kalo (taro) in the springs and fishing on the coast. 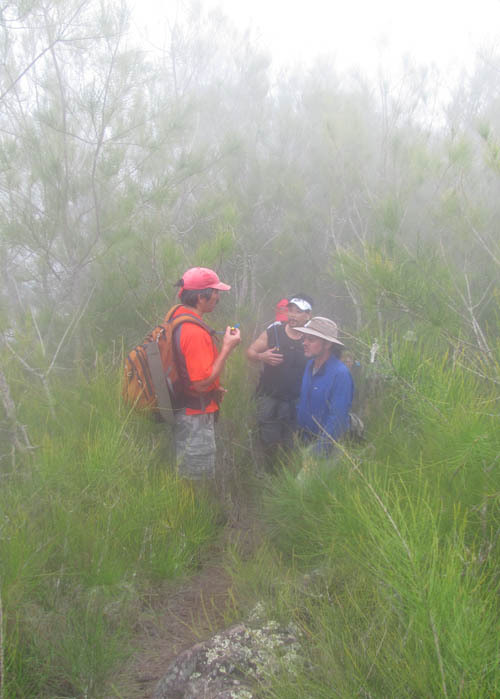 Pat and Richard regain the ridgeline after contouring on the side to avoid rocky obstacles. It was a voggy day but we could see the rocky point of Mauna Lahilahi on the coastline. 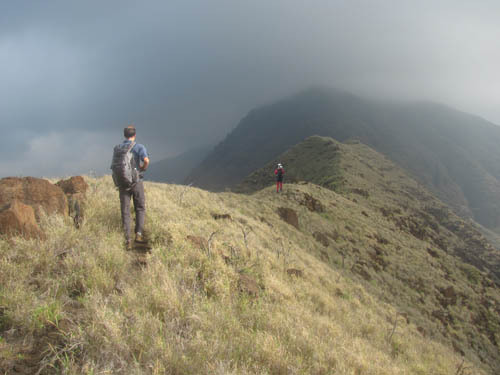 Kamaileunu Ridge once extended further than it does today and used to connect with Mauna Lahilahi. What a sight that must’ve been to see the missing part of ridge collapse into the ocean. Just before topping out on the first big climb, I was pleased to see a 12 foot Wiliwili tree (Erythrina sandwichensis) with healthy green leaves. Ever since the invasive wasp found its way to Hawaii, the trees have been stressed. The sight of such a healthy tree gives hope for the future. After the first big sweaty climb, we were given a cardiovascular reprieve. The incline relented and became a series of gentle rolling hills. But loose rocks were hidden in the grass and made the footing difficult. So we had to watch each step as we made our way over the landscape. 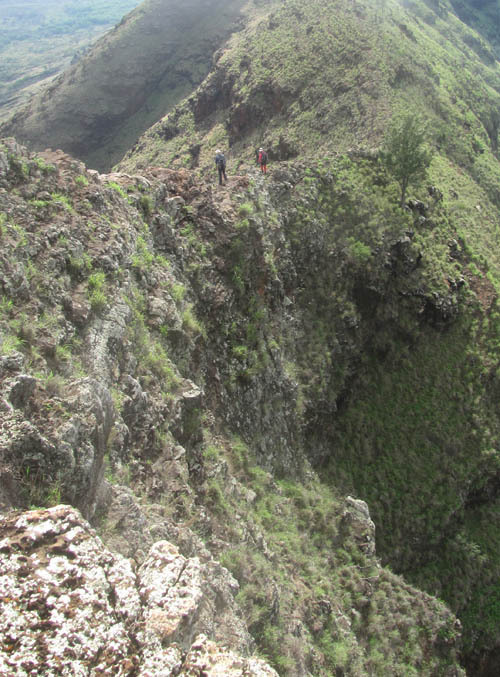 Inevitably the steepness returned and the heart–pounding climb resumed. We essentially followed the spine of the ridge but contoured every now and then to avoid rocky obstacles. Evidence of goats littered the trail. Kamaileunu supports a large population of goats. 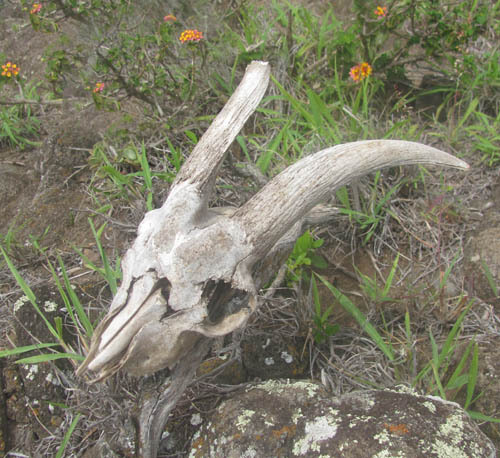 We saw several goats and their remains as we made our way up the ridge. 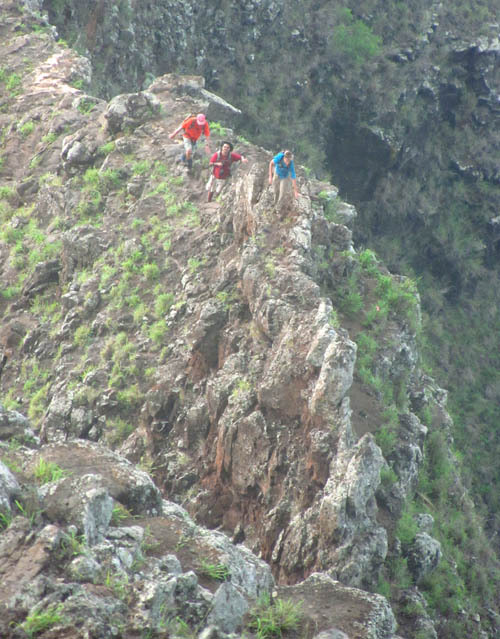 Enricky, Richard and Arnold, make their way over a dike sticking up along the spine of Kamaileunu Ridge with sheer drop-offs on either side. 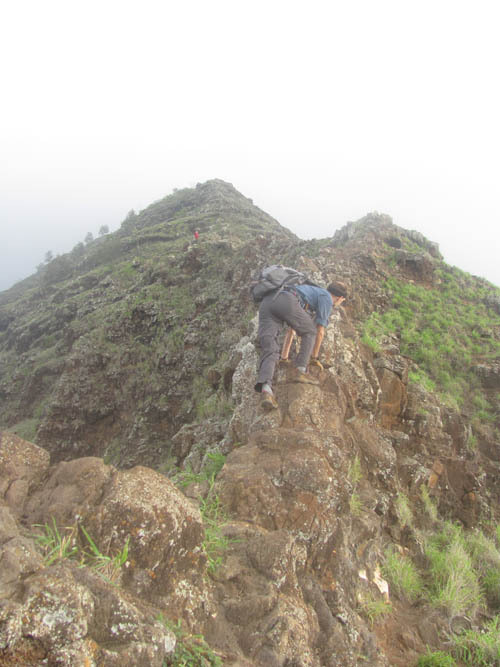 Hikers must conquer a series of false summits — hidden one behind the other – on the way to the top. Nothing is more disheartening than to think you have reached the top only to discover another peak hidden behind it. 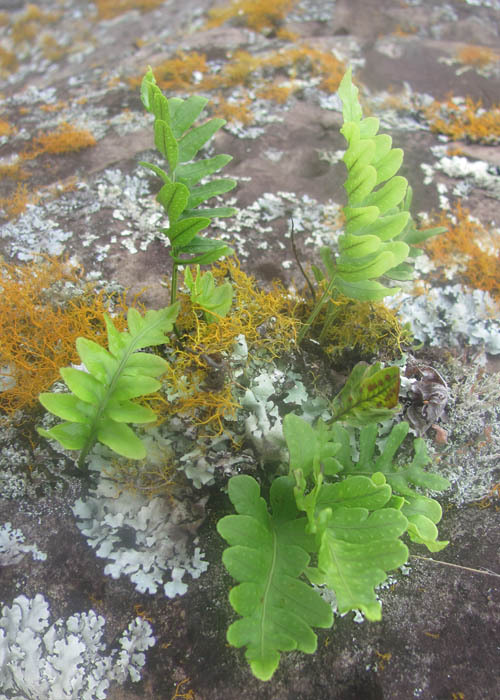 Cute little endemic ae ferns (Polypodium pellucidum) no more than 3 inches long thrive among the lichen on the rocks where moisture collects. Arnold drops down a small saddle where clouds shroud the tops of ironwood trees. 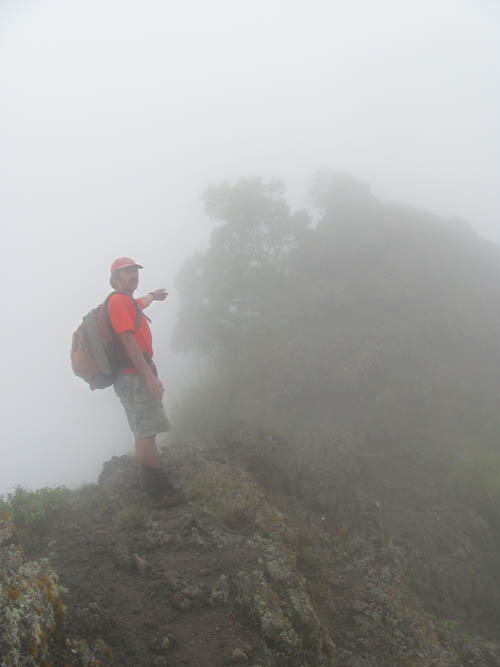 Clouds provide considerable moisture near the summit and enable much more vegetation to grow than on the lower flanks of the ridge. Many ironwood tree branches were covered with orange and white lichen. Lichen greatly increases the surface area of the tree allowing more cloud moisture to condense. 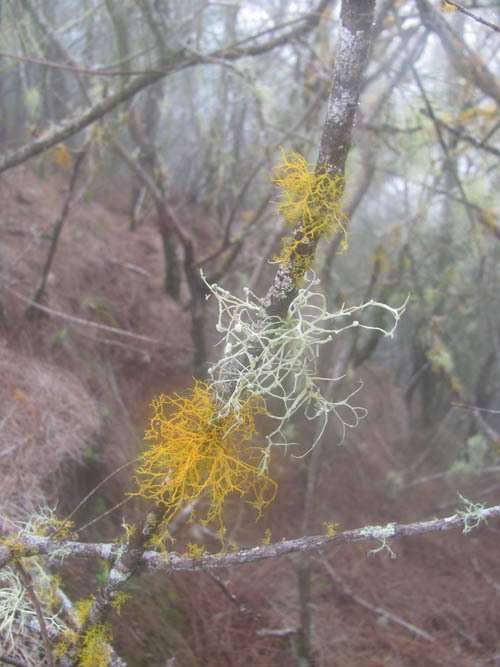 The orange lichen is Teleshites flavicans and the white lichen is Usnea australis. While making our way through the mist we ran into Steve Haus and the speed hikers, who already reached the summit and were coming back down. We talked briefly before resuming our last sprint to the top. Enveloped in a thick pea soup, Arnold Fujioka points to the final hump we must climb to reach the top of 3,210 foot Kamaileunu Ridge. While I was disappointed we did not have a view, I was thankful that the clouds shielded us from the sun and made today’s ascent one of the easiest I have ever done. 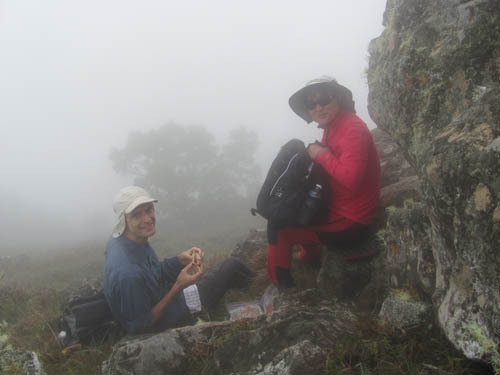 Pat and Miyo were already at the summit enjoying their lunch in the mist. Since we were no longer physically exerting ourselves, it did not take long for us to cool down and soon we shivered each time the wind blew. After lunch we pushed off from the summit to return the way we had come. The return leg of the trek can be an ordeal in the sun but clouds blocked the rays of the sun making the descent much easier. When we reached the heiau I was pleased that we were almost done and that we would soon be on flat ground. As we our way back to our cars, I reflected on what a great time we had climbing to the summit of Kamaileunu in the clouds. What a great hike! Great writeup and pics as usual Nathan! Thanks for showing us the cave and educating us on the history of the trail. When I saw the clouds up ahead I turned around at that time. By the way Enricky spells his name with a “cky”. Very unusual.